Look #1 is a Star Wars-themed strapless bubble skirt dress. This is an original outfit I designed and made myself using Star Wars bedsheets, some matching colored cotton, and a pattern to work from. Finishing off the look is a pair of yellow heels and a sterling silver and purple jade lightsaber pendant. Fabric: Star Wars Bedsheets. Fabric is fabric! I love the licensed fabric prints, but there are some great designs used on Star Wars bedding that make for great outfits. JoAnn Fabrics, Michael Levine, eBay and Etsy are my go-to sources. Pattern: Butterick, Simplicity, Vogue, etc. I started with pattern #5209 from Butterick, but halfway through putting the dress together I was inspired to veer off from the pattern design and changed the look of the top and the skirt. I already had these shoes in my closet, from an old cosplay no less! If I don’t wear black shoes with my outfits, I always love to wear a pair of shoes that shares a color that is in the outfit. Make your own, with help from tutorials, like our DIY Decoupage Tutorial! Or buy a pair of custom made shoes – there are plenty of sellers on Etsy who make unique geek shoes. 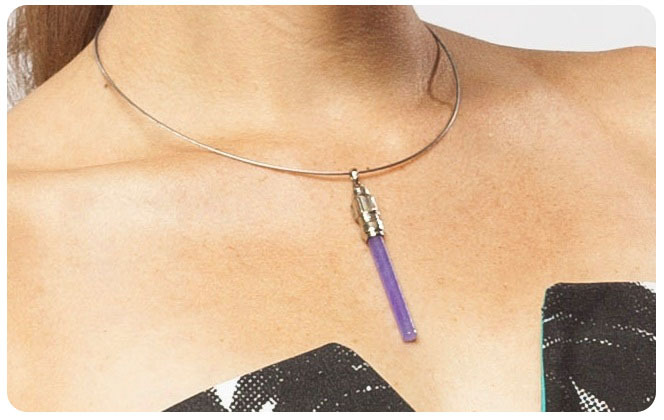 Lightsaber necklace. This necklace is an amazing licensed item from Lucasfilm that came out in 2005. 1000 were made and they’re just about non-existent at this point. But eBay is a girl’s best friend! There are few up there at the moment. What I love about this pendant is that it’s wonderfully geeky, but also looks like a normal piece of jewelry at the same time and is just really lovely. I hope these weekly “looks” will help show that any girl can be stylish AND geeky. Lindz and I aren’t fashion mavens by any means – we’re average geeks, average girls. If we can be stylish geeks, so can you! We’re reaching a point now where it’s easier and more accessible than ever before to be a stylish chic geek. Whether it’s a t-shirt and jeans, or a skirt and heels, the possibilities are endless. We’re looking forward to showing you a new look each week. We hope it will inspire you to put together your own geek chic ensembles, or add something to an existing outfit, and we’d love to see what outfits you’ve pulled together! If you have one, we’d love to share it, so please feel free to contact us via email or on Facebook.